The Real Estate Market Absorption Rate, Months Supply of Inventory and Days On Market are key indicators that provides historical data about where we’ve been but more importantly also tells us something about future house values, for the short term anyway. 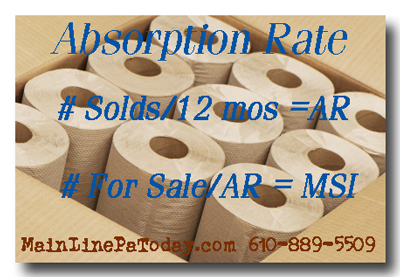 For some Chester County Main Line Pa news that you can use, try Calculating the Absorption Rate. Or contact me and I’ll prepare a Comparative Market Analysis for your homes value price range, neighborhood and community.